How to promote a product massively for long term traffic! →How to promote a product massively for long term traffic! Creating and launching a new product is not enough. You must be able to map out strategies to massively promote your product for short term and long term traffic. There are known methods to take your product to the market and get instant traffic. These are of course paid traffic sources. My problem with these is that as soon as you run out of budget, the traffic instantly stops flowing. I just read a post on Nanda’s where he mentioned 6 best places to promote your product online. Nanda mentioned platforms like Google Adword, Twitter, Microsoft, LinkedIn, etc. Check out his post for details how to use these platforms. I’m however looking at this from a different angle – Which method can you use to spread the word and get traffic now and possibly still get more traffic in the future? I don’t have a problem with PPC (social or search) and banner ads. However, these methods only work within your budget limits and end where your funds end. A Google adword campaign of $500 cannot bring you more traffic after the budget gets used up. So what’s the better way to promote your product with $500 for traffic now and in the future? Bloggers, the outstanding product promotion machinery for short term and long term traffic. Many product owners are yet to discover the inherent strength bloggers have to help promote their products and boost their sales. Now, I’m not talking about you creating a blog for your product. That’s of course a requirement to stand the current market challenges and competition. As a matter of fact, Adrienne Smith, in one of her guest articles on creativeclickmedia.com share with us 5 reasons why blogging is good for your business. Check out her article here!. That’s not all! Neamat Tawadrous also shared with us on her blog 7 reasons why you need a blog for your business. I recommend you checkout that post too. Click here to read it! What I mean here is collaborating with bloggers in your niche through promoted posts. This, to my opinion is the most effective way to take your product to your target market and beat your competitors. Try running a search query on Google using your target keyword. You will be shocked how many of the entries on the result page are blog posts. This is a clear pointer to the effectiveness and power of product reviews on blogs with attractive search engine positioning. If you want to promote a product massively for both short term and long term direct and search traffic, go sponsor review posts. Let’s see however what results we can achieve with $500 budget with different strategies. CPC: $0.30 (I want to be very moderate. If your product is highly competitive, you may end up spending over $1 per click). If we go by $0.30 per click, then $500 will give us 1,667 visitors. If we go by $0.50 per click, then $500 will fetch for us 1000 visitors. If we go by $1 per click, then $500 will bring us 500 visitors. If we go by $0.10 per click, $500 will bring us 5000 visitors. Another way is to buy banner space on related websites – something like 5 spots on 5 different sites at the rate of $100 per spot. This for the most part will run for 30 days. In this method, you cannot really say with certainty what your ROI will be but one thing that’s sure is that your banners will be taken down as soon as the advertising periods run to their ends. There is still a problem here as social medial posts have a very short life span. Lisa Buben, in this post has shared some interesting statistics you should check out. According to that post, the average Facebook post lasts 3 hours and 18 minutes for Twitter tweets. Make sure you check out that article for some more details. I personally think putting your $500 on social media advertising is worthless for long term traffic – except you want to build a follower base, which of course will be useful in the future. d) Sponsored posts – the way to go! Each review article will be long enough to reveal the worth of your product. different articles written by different bloggers will help the readers in coming to final buying decision. You are going to have more sales simply because most buyers will trust the opinion and endorsement by their trusted bloggers. Once an article is written and published, it will keep bringing traffic even after years. You will have backlinks pointing to your product page. Both dofollow and nofollow backlinks are good for SEO. At the very basic level, $500 can get 5 unique and fresh articles written and published on 5 fairly popular blogs. At a very low scale, these 5 blog posts can generate 200 to 300 visits to your product page daily during the first and second weeks of publication. During these early days, you only get traffic from the bloggers’ loyal readers, list subscribers and social media friends. One to two weeks after your promoted articles get indexed and positioned in search engines, you start getting more targeted traffic. This can go on for a very long time depending on the blogs and the review abilities of the bloggers. Now, your point of interest is targeted exposure. While blog design and beauty are important factors, I recommend paying attention to blogs that can generate the right traffic you need. First, make a list of blogs in your niche. You can get these from blogging communities by visiting and listing blogs that publish in your category. Buysellads.com too is another platform to make a list of blogs that target your niche. Secondly, search Google for your keyword. This will certainly list blogs that relate to your product. There are various other ways to collect and list blogs that are in your niche. The next thing is to filter them, removing low quality blog. These points will help you know which blogs are more active than others. Write them down in order of popularity and contact each blogger one after the other. You should already have determined how much you are ready to pay each blog for a sponsored post. Don’t just completely throw it over to the bloggers and expect better results. You have to be able to set roles and requirements. For each blog you want to work with, provide a set of keywords. If not, you may have every blogger targeting the same keyword. You will discover more than 5 blogs ranking for this keyword. That’s not to the advantage of the advertiser. You will want to be on Google page 1 for as many keywords as possible. This keyword pattern (product name review) seems to be the easiest to rank for. That explains why every blogger reviewing a product goes for it. Links on sponsored posts are paid links. There is no way around it. We know that’s what Google is fighting against. If these links are dofollow, you make yourself (you and the blogger) Google’s enemy. In order not to stand the risk of being penalized, request for a nofollow link. You will still get direct traffic, brand promotion and of course (and very important), a balanced link profile. Link to review posts from your product page! Many product owners don’t do this but I think it’s important. It helps anyone reading your product to get exposed to more information and more knowledge. This will facilitate the buying decision. It also serves as testimonial and endorsement from many more users. Here is my humble opinion – if you want to get more exposure for your product especially in the long term, do get to bloggers in your niche to write and publish articles about your products. That will be much more valuable than spending on campaigns that are short-lived. If you think you have a product I can review for short and long term traffic, don’t fail to contact me for an 800+ review SEO friendly post and an unbiased opinion. Let me hear from you in the comment box. If you are a blogger, what do you think about doing product reviews and getting paid? If you are an entrepreneur with a product, is this something you will want to try? I loved your article. It was insightful. I think, doing products reviews to promote a product is a wise decision. As you said, the reviews of products that will continue to live in your client’s blog. That way, traffic will continue to come for sure. BTW, you say that for sponsored posts should use nofollow links, but what about the guest post? Honestly, at this time I get an offer to guest post on my blog, she said that wanted to dofollow link to one of the links in the article. Dofollow links that lead to the homepage on her site. After I read the article, it was a good article I think. What do you think about this? Did you notice I gave you a dofollow link in this article? That’s because I endorse what you wrote and Matt won’t have a problem with that. It’s no guest post, no sponsored post and I gain absolutely nothing from it. On the other hand, dofollow links on guest posts could attract sanctions if Matt thinks there was some reward involved and if the article looks product-promotional. I personally won’t give a dofollow link if the article submitted by the guest author is meant to build links. If an author contacts me and requests a dofollow link, I don’t even reply to such mails, and I get them almost daily. 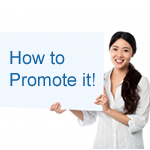 This are some ultimate ways to promote any product on blogs. From this post i also learned that we can promote our sponsored review by putting our sponsored review ads on our Friends blog which will help the company get more traffic and we get more money as well as my blogger friend also get. Another mind-blowing read on your blog! This one is fresh and fantasic trust me. I am now very focused on selling my own products as I have been writing eBooks lately than writing blog posts. The CPC, the social networks, justretweet and the likes are good but doesn’t promise long term traffic and sale like the sponsored review you so well highlighted upon. Thanks so much for writing this, I sure will be looking to this when I’m ready to start selling my products. BTW, I shared this post on kingged.com ad left this same comment on it. Long-time promotion for a product might seem quite impossible in the present. But I think with your actionable tips, I would be successful at it. Good to see you around and thanks for the comment. Sponsor review posts offer better leverage than other promotional campaigns like banner ads and PPC. Long term traffic is sure to come if the process is applied well. One thing I am certain that will make this work effectively is the review ability of the blogger. Every blogger don’t have the creative ability to write reviews that would compel readers to take action. Choosing the best reviewers will make this process work effectively. Other factors highlighted in this post that would make it work include having different reviewers target different keywords and applying NoFollow in building links. Your points have been clearly made. For many, this will be new idea! As always another great and detailed article. We know that keyword prices with PPC keep going up, and the little guy is getting squeezed out by the companies with deep pockets. I would have the nerves to try it myself. I’ve heard of blog paid posts, but have not thought much about it. You bring up some very interesting points and they sure get me thinking. I can see where it would be a much better long term traffic strategy. And your right, with other traffic sources, they are usually short lived. Plus it if a win-win for bloggers. They get paid for posting, not hoping banners get clicked by buyers. You sure have me thinking. This is something I will defiantly be looking to soon. Also, great tip on the nofollow. Never would have thought about that. But wasn’t that one big thing about paid blog posts, to get linkbacks? Dofollow was the charm of promoted post in the past but this has changed direction now. As a matter of fact, the number of sponsored post one could have monthly has dropped. that means a lot of people did it in the past for the SEO backlink. However, one of the sponsored post I did with nofollow is standing right on spot #1 on Google page #1 for a good keyword. The product owner still gets targeted traffic from that post. We should not fail to understand that th nofollow links are necessary for a balanced backlink profile. If you have 100% dofollow backlink, you are standing on hot grounds. I have not undertaken any product reviews or paid posts, but it is certainly something worth considering. All the strategies and tips that you have listed above for promoting our product massively seems very useful for us to promote our product worldwide. Yep Through blogging we can promoting our product worldwide and get good response and also get good traffic for short and long term. This is outstanding article, I agreed with Sunday that Sponsor review posts offer better leverage than other promotional campaigns like banner ads and PPC. Long term traffic is sure to come if the process is applied well. Thanks for you valuable article. Good to see you around today Waqas and thanks for the comment. So how are you doing btw? Another great posts with lots of good information as you always do. Thank you so much for mentioning my guest post to over at Adam’s blog, that was very nice of you. I was happy to do that one for him since so many small businesses still don’t get the importance of having one. I’ve never done a sponsored post and I believe it was over at Lisa’s blog when she wrote about that. I now understand that the links need to be nofollow but I was thinking that if someone was paying you to write about their product or service that they would want those links dofollow. That’s what I was uncomfortable with so this just makes so much more sense to me. Yes, the dofollow link used to be the attraction of paid post. But with changes today, it’s almost the opposite. Any links in paid posts are considered paid by Google and if such are dofollow, Google frowns at them. So to be on the save side, unfollowing them is the way to go. Advertisers still have benefits if the posts are well written and optimized for better ranking. Do you intend to start that on your blog any sooner? Hi Enstine, thanks for the mention on your post. I do some sponsored posts if they are relevant to my niche, beliefs and readers. I do use nofollow for them and most things now on my blog. I never thought about paying others to do them for a product. Maybe when I do a 2nd edition of my e-Book it will be something I’d consider. I like how you showed us the difference here in the different methods to promote products. It gave me more ideas for that upcoming eBook. Thank you! Lisa recently posted…Do You Know Your Social Media Etiquette Today? One other way to go with it is offer free copies to bloggers. Even at that, the links should be nofollow. It will be great idea to get your keywords ready and don’t just throw everything in the bloggers’ camp. Waiting for that 2nd edition. I had the same problems with my Ad word campaigns.I really had no idea to promote my products and services. Then i changed my way and stopped spending hundreds of dollars on useless campaigns which intend bring less traffic and started to using social media as a good stage. Yes, Social media is way better than any other.But there are many other conventional methods to to bring traffic to your product like enstine muki explained. Sponsored posts and social media campaigns are best in my view.As i revived tons of traffic from them and still, tend to use these methods. Thanks Himanshu for dropping a comment. I hope these tips will really be of great help to you. I was just thinking about this topic today. I’ve done PPC campaigns and done solo ads, but I how can I keep the promotion going after my marketing budget runs out? Then you wrote a post about product reviews and sponsored posts! This is something I’m going to take into consideration! Thanks for sharing these tips! Social media campaigns – an awesome way to promote a product or a service. Twitter is widely known as the best tool by just retweeting the post. Even so, you have a point about short-term traffic. We want long-term traffic, I am thinking about promoting your product by publishing a post and awesome if loggers in your niche to write and publish articles about your products. metz recently posted…Why Professional Web Developers Prefer Tableless Layout for Their Clients? I must say that it is an excellent guide to promote products Enstine sir. Good to see you here again Nirmala and I know you are always around. This is my first time in your blog and I definitely like what I read. I also wrote a blog post last week about the importance of having a Blog for your business to brand yourself and promote your products and services very close to Adrienne’s post. I totally agree with you about finding ways of promoting our products to keep bringing traffic when our budget runs out. I liked the idea of sponsored posts. I have to go to Lisa’s blog to read more about that. It’s really worth considering. Thanks Enstine for a great post and I am glad to visit your blog. Have yourself a great rest of the week. Social media is best way to generate traffic .Social networking strategy is far easier than managing traffic. It is one of the best network for business promotion and Companies always want to find new ways to promote their brands and products.Many thanks for a fantastic post. In order to generate, whether a short or long term traffic, you need to think of an effective strategy to massively promote your marketing business. You’re right that paid traffic has been the most prominent and fastest way to promote your business and get an instant traffic. However, it will only be successful as long as you have the budget. What if you run out of budget? That’s the problem. Now, if marketers will just be more wise and practical, they will follow these tips you’ve shared. Blogging and affiliate marketing has been the takeaways I’ve learned here. These two methods are indeed cost-effective and will surely help you get, either short or long term traffic. With the right approach and patient, I’m pretty sure that you’ll succeed. I’m already very much interested in long term traffic that converts and that’s why came here at your blog to discuss the deal with you where you have to review or possibly hold a contest promoting my site. Enjoyed this information and now I’ll not waste my time over other options so excuse me and lets discuss over the email. I read this at right time 😉 , As I am going to launch a product based on education niche in next month. This tactic I am gonna use to promote it.